If you’re part of the American workforce or you work hard every day as a stay-at-home-parent, we’re going to go out on a limb and guess that you could use a well-deserved break. Now, it’s hardly a secret that ample rest and relaxation are key to a healthy work-life balance and an overall positive state of mental health, but the truth of the matter is that too many people forego taking care of themselves in favor of working long, taxing hours and enduring stressful situations. According to the academics over at the American Psychological Association, they would agree with our sentiments above — even to such an extent as to label chronic stress as a developing public health crisis. According to the APA’s 2010 Stress in America survey (we fear that stress in America has only become more prevalent since then), the vast majority of those surveyed are suffering from “moderate to high stress.” Some 44 percent of those surveyed reported that their stress levels increased over the past five years. Of the reasons cited for their stress, concerns about money, work, and the state of the economy were among the most frequent. Self-care isn’t a priority: stress is taking a definitive toll on people’s well-being and their health is suffering as a result. From eating a poor diet and lying awake at night to infrequent exercise and simply not taking enough downtime to focus on mental health and relaxation, stress seems to dictate how people are living their lives outside of work. A lack of willpower is largely to blame: it’s true that we’re ripe to create excuses for ourselves. Though many respondents believed that they could change their willpower if they had more money, time, energy, or even confidence, Americans cited a lack of willpower as the primary barrier to adopting positive, healthy change in their lives. It’s not just adults who are stressed out: sadly, stress appears to be taking a toll on kids, too. Part of this explanation is that parents bring home stress and circulate it around their home environment, unknowingly subjecting their children to the stress that they’re dealing with. Stressed-out kids tend to overeat, sleep too much, or engage in too much sedentary activity, leading to weight issues and subsequent bullying at school. So, the problem that we’ve identified must be painfully clear at this point: people — namely Americans — carry a great deal of stress on their shoulders. We’ve driven this point into the ground because we believe in the importance of dealing with stress in a healthy manner, ultimately leading to a happier and more fulfilling life. Our solution? It’s true that everyone deals with stress differently, and we respect that. However, it’s our firm belief that a nice soak in a hot tub is one of the most effective ways to naturally melt away stress. As a Bullfrog hot tub dealer in New Jersey, Spa Hearth & Home is dedicating this page to not only addressing the stress epidemic itself, but covering natural and effective ways to tell stress to “take a hike” (interestingly enough, taking a hike is a great natural way to combat stress). We truly believe that in today’s information-driven society, the rest and relaxation necessary to manage work-related stress is of paramount importance. After all, the United States economy, various job markets, and the overall state of affairs around the world are less black-and-white and more complex than ever before. Of course, we won’t open that conversation box for fear of inducing more stress — besides, we’re here to discuss some truly incredible ways to rest and relax! How Can Soaking In A Hot Tub Help Me? There are even more stress-melting benefits to be gained from soaking in a hot tub. Spa Hearth & Home will touch on more information about hydrotherapy and home spa benefits below, as well as other general tips that are conducive to rest and relaxation. At the end of the day — literally — who doesn’t love a little R&R? No matter how stressed out you are from work, school, or even personal relationships, addressing your stress is always going to help you. As a Bullfrog hot tub dealer in Maple Shade and the greater New Jersey area, that’s our aim. Here’s the most obvious statement you’ll read all day: hot tubs are hot. They’re also wet, and when you combine these two elements, you’re soaking up the benefits of hydrotherapy and heat therapy all in one easy, convenient experience. Ideal for athletes and those who could benefit from pain management (extreme stress often results in physical pain in the form of muscle soreness, headaches, etc. ), heat therapy provided by a Bullfrog home spa offers a natural way to alleviate and even cure body pain. It all comes down to the increased blood circulation your body experiences when subjected to being submerged in hot water. Not only are tension and pain rapidly alleviated in a hot tub, but there’s no medication involved such as in the case of anti-inflammatory drugs. 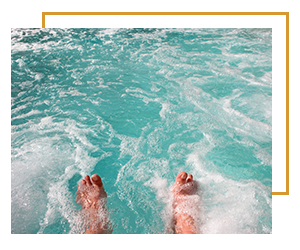 Even better, stepping foot in a hot tub and soaking up that warm, pressurized water couldn’t be any easier. Just sit back and relax for a while! It really is that easy to let your worries melt away while heat therapy helps restore and rejuvenate your body. Additionally, unlike other forms of supervised medical treatment or even full-blown medical procedures, using a hot tub as a method of pain relief allows you to do it by yourself and on your own time. The benefits of owning and soaking in a hot tub from our New Jersey Bullfrog home spa dealers go well beyond the physiological ones. Though hot tubs have shown to be very useful for athletes by helping increase blood circulation and even oxygen circulation, they also provide a very meditative, present and “centering” experience as Spa Hearth & Home touched on above. Could a big tub filled with hot water and pressurized jets really help you get closer to your family or simply decompress after a long day with a friend? Absolutely. Finding the right opportunities to spend quality time together can be difficult if you’re a member of a busy family. Even if everyone is home at the same time, this rare occasion may be spent watching the latest Hulu special in silence or with everyone browsing their smartphone. While this sounds like a jaded critique on society’s obsession with looking at screens, that is the reality of today’s social dynamic. Hot tubs are great because they encourage one another to legitimately conversate face to face! Unless they’re willing to risk dropping their phone into the hot tub, no one is going to be using any of their devices as you’re soaking it up. Time and time again, numerous studies have shown that families who spend time together raise kids who are happier, healthier, more productive, and receive higher academic measures. If you’re just looking for some one-on-one couple’s therapy, relish some time in your Bullfrog home spa without the kids. People take vacations for a number of reasons: to visit relatives across the country, to see popular destinations in person, or even just because they have a bunch of airline miles racked up on their credit card. These are all perfectly valid reasons to go on a relaxing trip, but the main reason that Americans vacation is exactly that: to rest, recover, relax, and de-stress. What if our Maple Shade Bullfrog hot tub dealers told you that you can take a quick 15-20 minute vacation every day? With the power of a home spa, you can! Sure, you might not enjoy the same level of adventure or exotic qualities of the beach or the mountains right in your backyard or your bathroom, but a soothing dip in a hot tub does help melt away the stresses of daily life. Indeed, there have been multiple independent studies that have confirmed the fact that a warm water massage helps stimulate the body’s release of endorphins. You may recognize endorphins as your body’s natural “feel good” chemicals that are typically released during or after moderate to vigorous exercise. The best part about the endorphin release associated with hydrotherapy and heat therapy is that you don’t have to “earn it” in the same way that you would with traditional exercise. The only sweat you’ll be breaking will be from soaking in a warm tub, and you’ll step out of the tub feeling fresh, clean (chlorine notwithstanding), relaxed, and possibility even a little euphoric. As far as a relaxation to effort ratio goes, it doesn’t get much better than that! 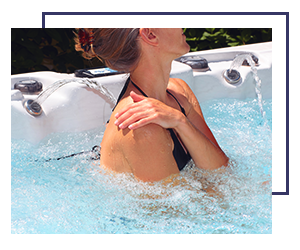 As useful and beneficial as a home spa is from our New Jersey Bullfrog hot tub dealers, there are certainly other practical and healthy ways to unwind and deal with your stress after a long day. While coping methods such as relying on alcohol, nicotine, and caffeine may prove fruitful for immediate relief, it’s important to know that these are not healthy ways to naturally de-stress. Talking to others, journaling what’s on your mind, playing a musical instrument, exercising, drinking herbal tea, and reading a good book are all great examples of healthy and positive ways to take your mind off of the stressors in your life. Ultimately, unloading the day’s baggage is a personal matter and what you do to relax at the end of the day may vary greatly from someone else. That’s just fine! We’ll begin with the importance of expressing yourself and simply talking about what’s going on with a friend or a loved one. When we have too many things bouncing around our heads at any given moment, it can feel like a mental explosion is imminent. Most people know that it’s unhealthy to bottle up their emotions, but what’s not quite as well known is that it’s also unhealthy to keep all of your stressors contained within you. Simply visiting an old friend over lunch or a cup of coffee or even chatting with your significant other at home after a long day at work will work wonders because you’re talking about what’s on your mind — and, more importantly, what’s been bothering you. Talking to someone doesn’t involve any drugs or other unhealthy substances, and it doesn’t even involve exercising or moving your body to stimulate your endorphins in order to feel better. The mere act of communication and expressing your current thoughts and feelings to someone that’s willing to listen will do wonders in de-stressing your frantic mind. Better yet, soaking in a home spa from our Bullfrog hot tub dealers in New Jersey is the perfect place to rant about what’s going on with a friend! You might be thinking to yourself, “But I’m not an artist; I can’t create much of anything!” Doubt yourself if you will, but you don’t need artistic talent in order to enter a creative state of “flow.” When we’re so heavily concentrated in making music, writing a great story, or even filling out an adult coloring book, our minds get swept up in the present moment. From a relaxation and stress-reduction standpoint, you’re no longer consciously thinking about what’s been bothering you. Distractions help you rationalize what’s been stressing you out when your mind does finally return to your stressed-out thoughts and feelings, as you’ll get a mental break to occupy yourself with. Even playing a game that you’re really passionate about playing will help distract you. Entertain yourself but make sure that you’re really into it. As our Bullfrog home spa dealers mentioned above, tell your stress to take a hike by going and taking an actual hike. Escaping the hustle and bustle of city life or work life and replacing it with the serene simplicity of nature can do wonders for your mental health. Walking helps our minds mull through what’s going on and think more “efficiently.” In addition, taking in the beautiful sights of nature just makes us happy. It’s hard to put our finger on it, but we genuinely believe that it’s only human nature to appreciate nature! If you don’t think that good-quality sleep matters, try going several nights in a row with only 4-5 hours of sub-par sleep. Realistically, most of us have gone extended periods of time without a great night’s sleep, so if anything, do your best to hit that magical eight hours of sleep each night for multiple nights in a row. Not only will you feel more energized, happier, and healthier, but you’ll be better able to get through the stresses of each day. At the very least, you’ll be better off than you were when you got poor-quality sleep multiple nights in a row. Attempting to get good sleep when you’re really stressed out is easier said than done, but do what you can to make it happen: go to bed earlier, exercise during the evening to tire yourself out, take melatonin or other natural sleep aids, and of course, go for a quick soak in your Bullfrog hot tub before you take a shower and hit the hay. 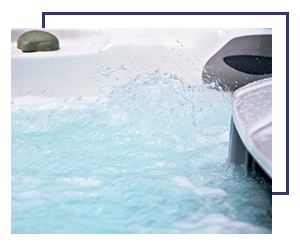 Consider A Home Spa From Our Bullfrog Hot Tub Dealers In Maple Shade! 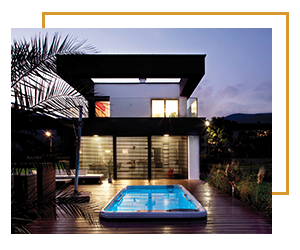 At Spa Hearth & Home, it’s our job to help you thoroughly enjoy your home with various add-ons like swim spas, patio furniture, umbrellas, saunas, fireplaces, and of course, hot tubs and home spas! Having a relaxation station like a Bullfrog hot tub right in the convenience of your own home provides unbeatable, de-stressing benefits that we encourage you to try out for yourself. So, what are you waiting for? Don’t let stress — and the inability to deal with it in a healthy, natural and relaxing manner — reduce your overall quality of life. Work with the premier New Jersey Bullfrog home spa dealer today by getting in touch with the team at Spa Hearth & Home!